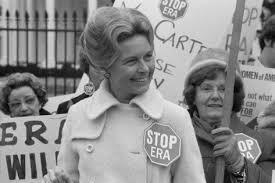 Longtime conservative icon Phyllis Schlafly is in the news again. This time, it’s because she has committed the cardinal sin–in the purist conservative rule book– of endorsing Donald Trump. As a result, she’s about to be booted from the throne she has occupied since the 1970s. The rest of the country may not remember her, but liberals in Missouri sure do: In the 1970s, she was the founder and outspoken leader of the “Stop-ERA” organization that later morphed into the “Eagle Forum.” Through the years, it has been an effective, if disproportionately influential, group that opposes just about anything that might guarantee or expand women’s rights—including those of the reproductive variety. The purpose of this post is not to rehash Schlafly’s ignominious history of standing in the way of progress for women. In fact, my disdain for her and her ideas make it painful for me just to type her name on my screen. Somewhere in the 1970s, the St. Louis chapter of the National Abortion Rights Action League [NARAL] started holding an annual fundraising auction. It usually took place at the fancy home of a wealthy supporter. [It’s still going on, I think. I just don’t go anymore, because it’s gotten too far into the financial, fashion and social stratosphere for me.] But back then, when people came in blue jeans and ponchos, I attended. I usually bought something—often a work of art or photography by someone local—at a bargain price. One year, as a joke, the auctioneers offered a framed picture of NARAL’s arch-enemy, Phyllis Schlafly. When the item went up for bid, it had the desired effect–everyone laughed. I don’t think the organizers really expected that anyone would pay even a dollar for such a thing. But I was in a lighthearted and generous mood. And it was for a good cause. So I put in a bid, when no one else would. It was probably for $100 or even less. And I won. When I went to claim the loathsome thing, I expected to be booed for even touching it. Instead, I received a round of applause and kudos—for my bravery and sense of humor, I guess. For several years after that, I schlepped that framed photo with me as a “white elephant” gag gift [and it did, indeed, make many people gag] for birthday parties and other events. It got a laugh, but I kept taking it back home with me because no one ever wanted it. Many years after it had outlived its usefulness as a political joke, I think I tossed it in a trash can. I know it’s out there somewhere, adding to the pollution in a landfill. But today’s development in the halls of power of the Eagle Forum make me almost regret ditching it. The way things are going in this political year, I could use the chuckle. Next Post:STL landfill fire nears collision with radioactive waste: What’s next?